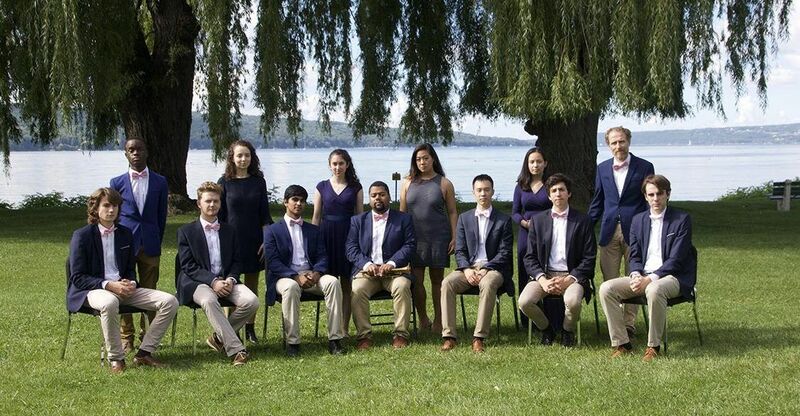 The Syncopated Times has been following Colin Hancock and the Original Cornell Syncopators since they first organized in 2016. At the time they were planning a centennial concert to celebrate The Original Dixieland Jazz Band‘s first recordings. Since that successful concert, the band has gone on to play the San Diego Jazz Fest, record two albums, and become a permanent part of the music department at Cornell. With Hancock and several other veteran members graduating this spring that ensured legacy is a good thing. There were two sophomores playing with the small version of the band when we saw them recently in Syracuse, the full group has something like 13 active members. Their future without Colin is promising. The concert was agreed to be one of the best that the Jazz Appreciation Society of Syracuse (JASS) has hosted in years. Held in a back room of the large Spaghetti Warehouse restaurant, the hot and sweet sounds of the band must have reached the right set of ears. As the band was packing up management approached them about booking a gig in the restaurant proper. It wouldn’t be out of the ordinary for them. The band has played everything from restaurants and concert venues to pool halls and frat houses, intentionally modeling the gung ho attitude of their predecessors of a century past. In fact, they have played the same rooms and buildings on campus that once heard both Bix and Louis. They played three 50 minute sets with breaks of no more than 15 minutes, around twenty titles total. Hancock is a scholar as well as a multi-instrumentalist and he enjoys sharing the history of each song. In addition to standards like “All of Me” they played more obscure numbers like “Boodle Am Shake” and several novelty numbers suited to a college band, including their original “Tacos”. They played both hot numbers and from a broader understanding of the sounds of the 20s. The band on this night was Cathy Li on cornet, Stephan Newcomb on tuba and reeds, Troy Anderson on reeds, Colin Hancock on reeds and cornet, (the band has access to a huge assortment of reed instruments), instructor Robbert Van Renesse banjo & vocals, Noah Li, drums, and Rishi Verma trombone. The band’s regular pianist this year is a student named David Connelly, but they have developed a friendship with the marvelous Ed Clute and he slid into the chair for about half of the show. Clute has become increasingly active as a performer recently, appearing with the Syncopators elsewhere and showing up at the Iguana with Vince Giordano. Troy Anderson, who has been with the band from early on, will be joining Colin Hancock at Columbia this fall. Hancock already has long friendships with many of the traditional jazz musicians in New York City and plans are afoot. His choice of Columbia for graduate school will benefit us all. Noah Li is also graduating. He’s moving to Boston, where the traditional jazz scene is smaller but better organized. I gave him some tips. I think he’ll fit right in. He stood out at the show for his vocals which were extra important in the absence of the band’s usual female vocalist. He has a natural and joyful stage presence and I can easily picture him waving a baton at the Boston area Roaring 20s Lawn Party. In April the Syncopators will be recording an album of collegiate-themed tunes for Rivermont Records. There were a host of college bands in the 20s, that some produced star players may not be surprising, but several also recorded national hits. The album will explore that material and history with the in-depth liner notes you can expect from a Rivermont release. We reviewed their first album about a year ago, their book at the time had developed mostly from preparation for the ODJB concert and a few ideas they had for their first appearance at the San Diego Jazz Fest. The band itself was also a nucleus of what the group has become. At the Syracuse show, we picked up their new live CD recorded at the Triad in NYC with the full band. The larger band influences both style and song choice but that the set had almost no overlap with the show we saw demonstrates the large book they have developed. They even play some of the collegiate material that may end up on the Rivermont CD. None of the musicians in the Original Cornell Syncopators are music majors, presumably, most of them will go on to meaningful careers in other fields. Plenty of colleges have jazz bands covering the big band sound of the Swing era. But the Syracuse show was true to the hot small group sound of the 20s and the Triad show CD is true to the larger hot dance band sound from before swing took over. Colin Hancock’s legacy at Cornell will be spreading an appreciation of these styles of play to the next generation of community leaders, the people who make jazz clubs tick and book bands for civic events. Wouldn’t it be lovely if more universities followed suit? Their first album, Wild Jazz, is available on Bandcamp.